BOYCOTT! is an Israeli group joining the Palestinian call for “boycott, divestment and sanction,” urging supporters around the world to back the Palestinian people by refusing to do business with Israeli government and institutions, a tactic modeled after the anti-apartheid boycott of South Africa in the ’80s. 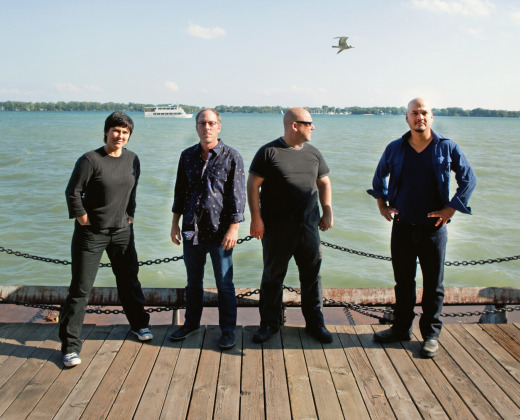 The Pixies, who resume their Doolittle 20th anniversary tour in New Zealand and Australia next week, have not publicly responded to the group’s letter. Following the trek Down Under, the band will play seven headlining concerts and festival dates in Europe in May and June before traveling to Israel for the June 9 show at Tel Aviv’s Expo Grounds. We are a group of Israeli human rights activists. We heard through the media that you are planning a concert in Israel in June. As much as some of us are huge fans and would love to hear your show, we won’t cross the international picket line that is growing in numbers steadily nowadays to come and see you.The picket line might not always be visible; yet it is there. Are you prepared to perform in Tel-Aviv while just under your nose millions of human beings are suffocating under a cruel Israeli military regime, denying them elementary human rights? Please take a few minutes to consider our appeal. Surely you know about the military occupation the Palestinian people have been living under since 1967. By the time you come to perform in Israel, Palestinians will have been under brutal occupation for 43 years – nearly half a century under a military regime that has already imprisoned more than 600,000 of them and that controls every aspect of their lives, including their freedom of movement, freedom of speech, religion, and trade, access to education, access to their lands, and often their right to live! You might also be aware that by continuing the military occupation over the territories taken in 1967, Israel violates numerous Security Council resolutions, the Fourth Geneva Convention, and most recently, the International Court of Justice ruled that the so-called “security fence”, built by Israel on Palestinian land, is illegal. Palestinian farm land has been stolen because of the Wall, and new settlements for Jews-only have been constructed on that land. This, in effect, destroys Palestinian livelihoods throughout the West Bank. You surely also know that, about a year ago, Israel attacked the Gaza Strip, which has been under a crippling, life-costing siege for almost 4 years. Israel used extremely lethal weapons in this attack, killing about 1400 people, 1/3 of whom were children. Phosphorous bombs were used in densely populated areas, and thousands of houses were destroyed. Israel’s Foreign Minister, Tzipi Livni, one of the architects of this attack, boasted: “Israel demonstrated real hooliganism during the course of the recent operation, which I demanded”. The division of the Palestinians into smaller sections which Israel needs to “deal with” (i.e. oppress and control) has not started with the separation of the West Bank and Gaza Strip, or with the internal break down of the West Bank into smaller segregated areas. What Israel wants the world to overlook – via the way it has constructed its “peace processes” – is the fact that this occupation is part of a larger colonization and oppression project. This project, dated back to Israel’s formation days, is intended to deal with the state’s “demographic threat”, termed by many “the Israeli apartheid regime”. The Israeli regime targets all Palestinians systematically, including those living inside Israel’s 48 borders with Israeli citizenship and refugees who were expelled by Israel during the 1948 Nakba and the 1967 war. Most Palestinian refugees are stateless, living in the diaspora, in countries adjacent to Palestine\Israel, awaiting their return home. Many of them are still living in refugee camps. In spite of UN resolution 194, which called for their return and compensation by Israel, Palestinian refugees are denied all that, and for the most part, are even denied entry to Palestine\Israel. 22 years ago, in 1988, following the first intifada outbreak, you mentioned Gaza in your new song “River Euphrates”: “Stuck here out of gas/Out here on the Gaza Strip/From driving in too fast”. Whether you meant to construct a metaphor or referred to previous gas shortages, we can’t help notice the resonance to what is taking place in Gaza today. After the years-long Israeli siege, the Gaza strip is deprived more than ever of fuel and energy – as well as food, medicines and many other necessities. Gaza is out of gas not just for movement by car within its sealed perimeter, driving fast or slow, but for electricity, health services, cooking and any sustainment of normal living conditions. Any normalization attitude towards Israel means also allowing this siege to go on. Whether you cared or didn’t care for Gaza then, how can you not care for it so blatantly NOW? We thus urge you to follow the Palestinian call and postpone your performance in Israel in order not to cooperate with the lethal “business as usual” status quo. If you care about justice, if you care about justice to the Palestinian people, if you care about the Israeli people, please add your voice to those calling for a saner policy with justice for all – and refuse to perform in Israel until there is freedom here. More Jew-hating Nazi propaganda from the descendants of Hitler’s right-hand man Haj Amin Al Husseini (Yassir Arafat’s uncle). May all those who pretend to be from a superior race or from a chosen people be cursed. Wake up, stupidy is amongst all people. SAME RIGHTS FOR SAME HUMANS. Israel is ruled by a faschist governement. Please be aware that participating in the Arab boycott violates the USA Laws including the 1977 amendments to the Export Administration Act (EAA) and the Ribicoff Amendment to the 1976 Tax Reform Act (TRA). These laws cover any entity seeking to do business in the United States. Participants in the Boycott, upon seeking to do business in the United States (in this case concerts in the USA the selling of music products and periphenalia) are subject to both civil and criminal penalties. The penalties imposed for each “knowing” violation can be a fine of up to $50,000 or five times the value of the exports involved, whichever is greater, and imprisonment of up to five years. During periods when the EAR are continued in effect by an Executive Order issued pursuant to the International Emergency Economic Powers Act, the criminal penalties for each “willful” violation can be a fine of up to $50,000 and imprisonment for up to ten years.